The Deep Sea fishing here in Fort Lauderdale continues to mirror the previous two weeks with some very nice fish available but with the overall numbers of fish continuing to be below what we would prefer. Fishing the reef line and just inshore has often been below what we would like to see with only an occasional Kingfish and Bonito. The exception has been that occasional larger fish caught using those small live Bonito as bait. Some larger Kingfish continue to be in our area and have a soft spot for them, so we continue to spend some time there. We are also continuing to target the Blackfin Tunas by trolling just off the reef line and on out to 650 feet of water, which is just over 2 miles off the beach. These fish are working over small minnows and smallish flying fish and showing a tendency to hold in an area as opposed to feeding and then quickly moving on their way. This has been good as once we can locate them we can stay as opposed to beginning a search again for them. Occasional Mahi-Mahi out there as well. Fishing on the bottom on our local shipwrecks and good bottom structure has produced Grey and Golden Tilefish in the customary depths ranging from 400 to over 700 feet of water. We have had some success with Jacks on those same wrecks and good structure areas. A bright spot has been the larger sized Vermillion Snapper on these bottom spots as well. 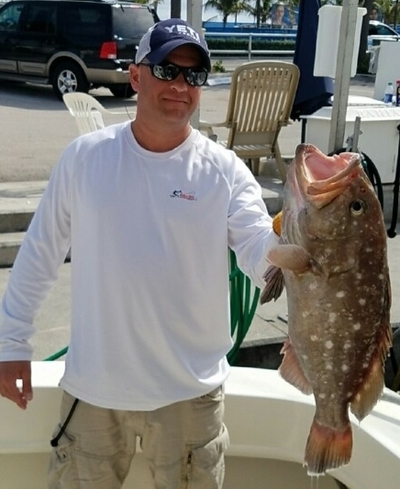 Snowy Grouper on the deeper spots, which are a Grouper species that is presently in season and therefor legal to keep. That is Greg in the photo with a good one, easily identified by those large snow colored spots. The weather and fishing conditions have been great. Mild days of bright sun with very little wind. Calm sea conditions day after day along with only moderate light current situations have allowed us the ability to move freely and fish our spots comfortably, which has been huge, as choppy seas and big current would be a poor mix as we try to make the best of available options.